From its very beginning, Del Mar has been graced by the rich and famous. Bing Crosby was on hand to welcome patrons on the track's opening day. Gary Cooper, a co-founder, was a regular visitor. Lucille Ball, Desi Arnaz, Ava Gardner, Jimmy Durante were all in attendance in its early days. And then there's Louie Gaines. 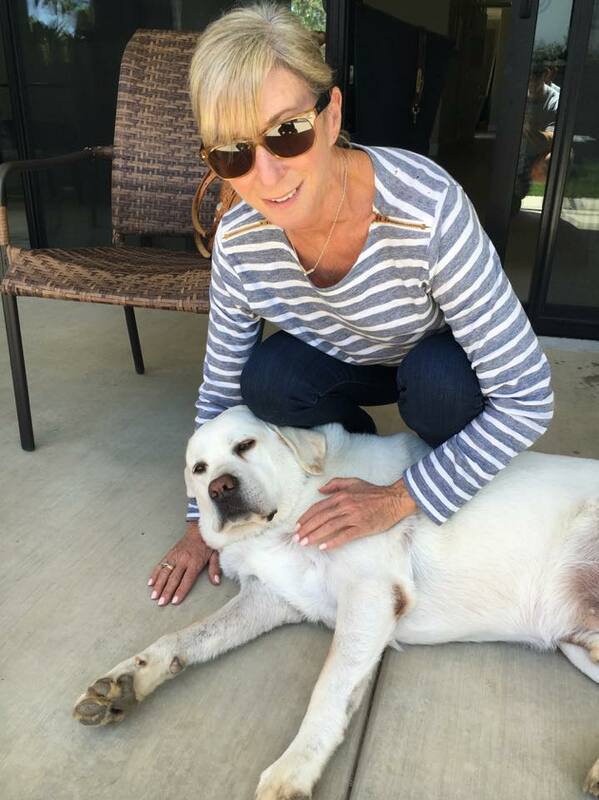 Louie is an 8-year-old Labrador Retriever belonging to Southern California trainer Carla Gaines. Del Mar is a popular place for dogs, who even have a designated portion of the nearby beach for morning walks, but Louie is a bit different. He's well recognized on the backstretch at both Santa Anita and Del Mar, where he is currently enjoying the summer meet. Louie accompanies Carla to the barn for morning training, where he socializes with clients, takes a dip in the Santa Anita fountain, and checks on horses – from afar. “They really like him. As a puppy, he kind of grew up at the track around horses, so most of my horses think he's one of them. He has the intelligence to know the ones that might be a little rough with him and the ones that are nice.,” said Gaines. “I train a horse called Bolo, and he's a Dynaformer line, and they're really, really hot horses. When Bolo first came in as a 2-year-old, he was so sweet and so kind. I would walk by the stall sometimes and he and Louie would be laying down together in the stall. Louie is so well-known that he stands in line at Clocker's Corner in Santa Anita to order his own bacon. 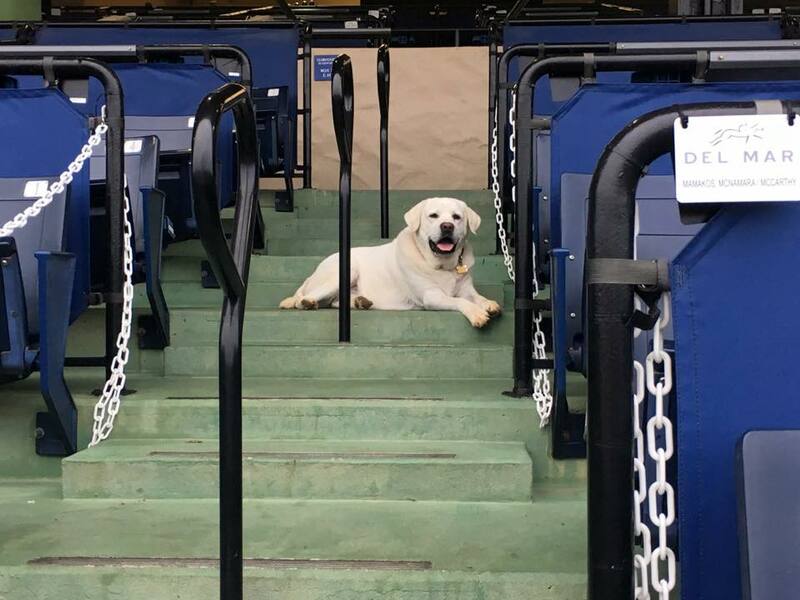 And Rosie Ybarra, longtime Clocker's employee (and a favorite of several canine visitors to the track), knows Louie well enough now that she hands him his order out the window, even if Gaines has had to step away for some reason. Louie has always been a dude with a unique personality. Gaines didn't really plan on getting another dog when she met Louie. She had had a tough year with several deaths in her family, and her black Lab was getting along in years. Her friends insisted a puppy would be good for her and her dog, but Gaines wasn't so sure. Then, when she was in Kentucky for an auction, she met young Louie and fell in love. “When I saw him, he was just like a little fluffy polar bear, so that was that,” she said. But Gaines was still based in California and needed to get the eight-week-old puppy home. She loaded him up in her rental car and set off for the Cincinnati airport for her return flight in the midst of one of the worst thunderstorms the region had seen. Roads were flooded and visibility was terrible. Gaines missed her flight, and got lost near the airport. She pulled over to give Louie a pit stop and call her airline. “All of a sudden, I see all these police cars with lights and sirens. They surround my car, because where I pulled over in the airport, nobody was supposed to be on that road. I guess it's some sort of electrical power station. I didn't know where I was and couldn't even see the signs,” she said. Gaines explained her confusion to the police, who were understanding, if a little damp. Gaines had to drive back to Lexington and stay an extra night. Like any celebrity, Louie is generous enough to pose with adoring fans, famous and non-famous, whenever possible. He's been spotted with Victor Espinoza, Art Sherman, Rafael Bejarano, and Britney Eurton. Louie's celebrity photos appear on his Facebook page, where's seen wearing sunglasses and earphones from time to time. According to Louie's posts, he considers himself a part-time lifeguard and firefighter in addition to his work as Gaines' assistant. Louie's Facebook page was created because one of Gaines' clients had two daughters taking high school photography courses and needed a subject to practice on. They graduated and went to college, but their father still snaps photos and keeps the page going. This entry was posted in Barn Buddies, Horse Care, NL Article and tagged barn buddies, bolo, california horse racing, carla gaines, Del Mar, louie gaines by Natalie Voss. Bookmark the permalink.